My Bright Life Archives - Pebbles, Inc.
Hey there lovely Pebbles Fans! Terhi Koskinen here, wishing you the most wonderful year of 2019 and inspiring you with the lovely colors of a rainbow. When I was going through both of the Pebbles collections revealed last fall, My Bright Life and Along the Way, I noticed how beautifully the colors of them joined together. That gave me an idea, why not to embrace the colors and create a rainbow layout! To make sure all of the colors and patterns would be visible on the layout, I first thought about some kind of grid design. 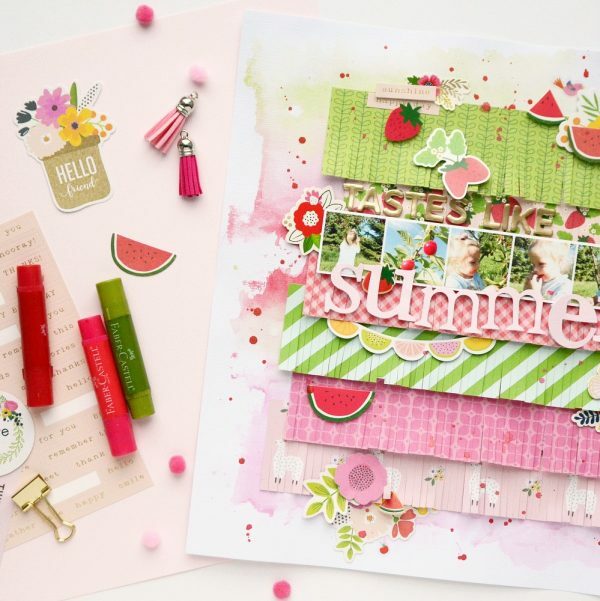 But when I was setting up my camera to film a process video, I saw the papers on the table the way I could see a little stripe of each and that really inspired me, definitely wanted to move that design to the layout. And as you can see, all of the patterns really ended up to the layout! It was quite tricky to squeeze them all in, but I managed. As the edges of the layout are very layered, I balanced the look by leaving the photograph alone. The same balancing theme was in my mind when I finished the layout with watercolors, I didn’t want to leave the edges all alone but again not to fill them up too much. Hope you’ll have fun watching the video! If you any questions, don’t hesitate to ask! Hello Pebbles Friends! 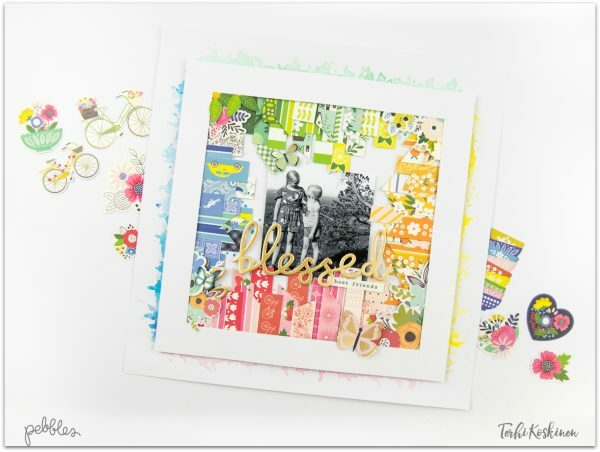 It’s Leanne here today sharing a layout featuring positive thinking! Or more so, featuring a reminder for me to refocus my energy into having a more positive frame of mind. Today, on World Mental Health Day, there can never be too much encouragement to foster self care. Our lives are constantly busy and our minds and mental health can often be pushed aside for more immediate chores surrounding us. Creating this layout became more of a challenge than I care to admit. One.. it was about me.. And two, making “Lemonade” from “Lemons” isn’t always my go-to attitude. But I am working on my own sense of positive thinking self care. 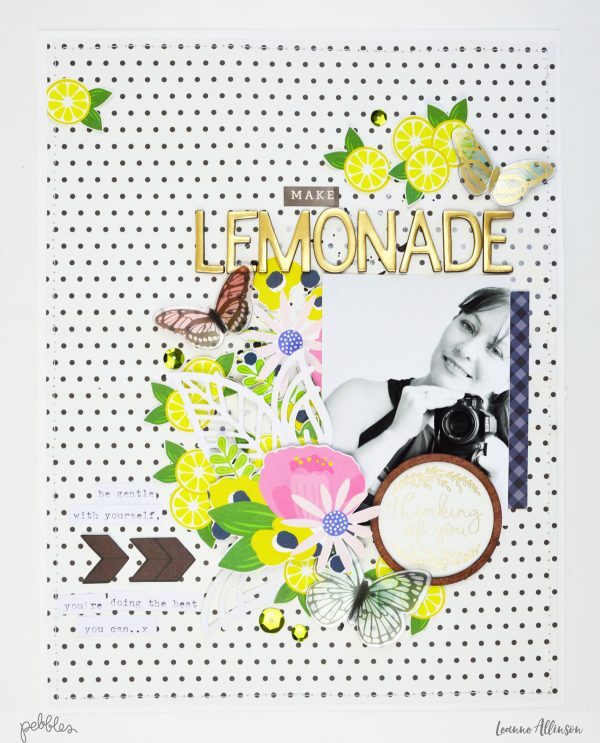 To recreate this page start with gathering supplies from the Pebbles Inc My Bright Life collection. 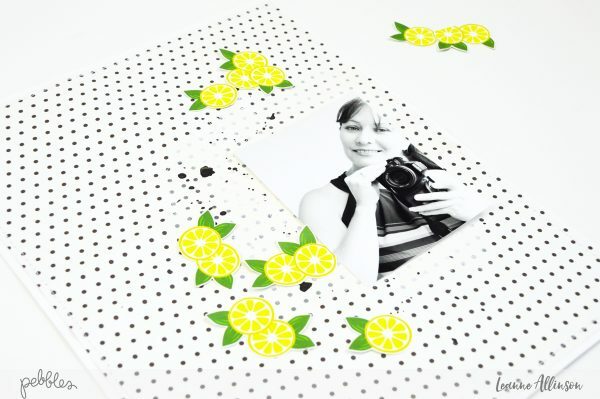 What could be more perfect than the Lemons patterned paper? 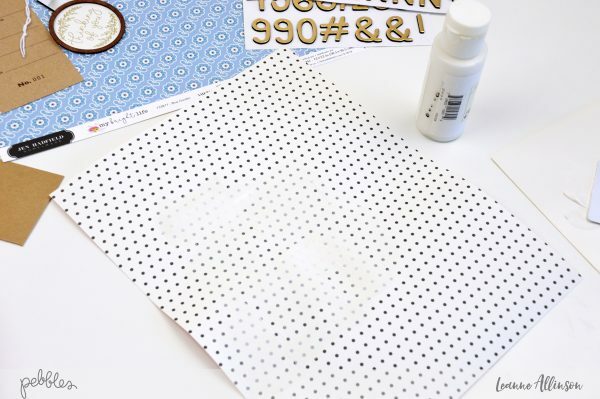 Gather also white paint and solid white cardstock. 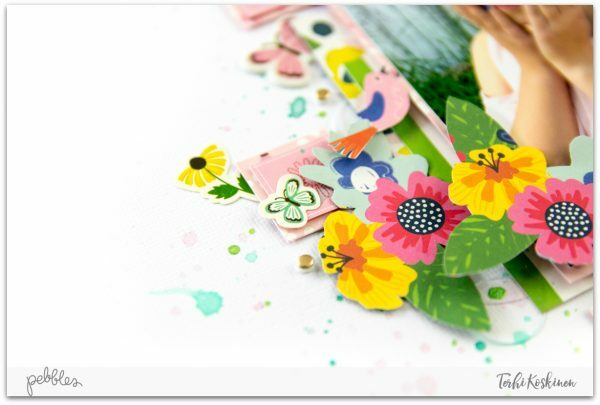 Trim the Sunflower patterned paper to 8.25″x10.75″ and lay flat to prepare surface area for a mixed media applied layer. Using an old gift card (or same sized piece of cardboard), scrape white acrylic paint where the photo will be positioned. Allow to dry and apply a second layer of paint. Once the white paint has dried, add a few splashes of black watercolour paint. 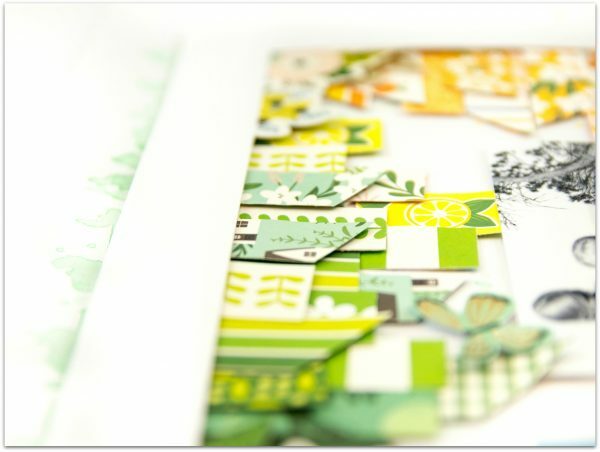 To prevent the layout from continuing to buckle, adhere to solid white cardstock, which has been trimmed to 8.5″x11″. 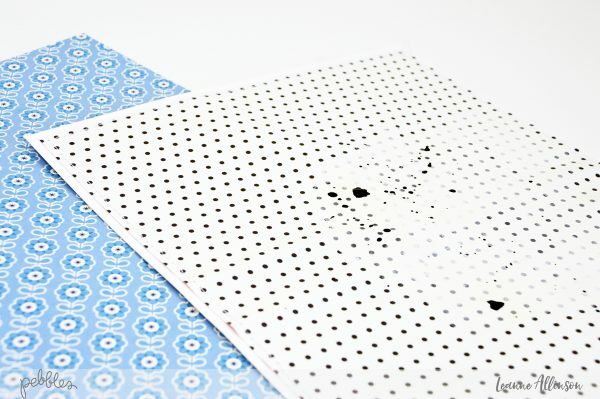 Carefully machine stitch around the outside edges, flattening the paper as you sew. Fussy cut lemon slice images from the patterned paper. When positioning the images, leave a place to secure the title above the photo. When fussy cutting, I removed the blue background and carefully cut along the outside edge, keeping the white border surrounding the lemon slices. Continue to add more layers of fussy cut images. 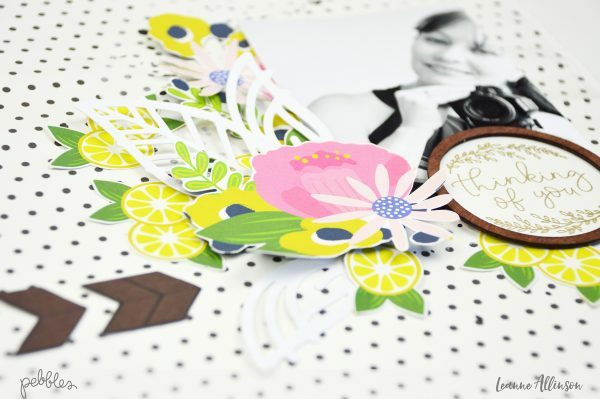 The larger flower clusters from the Flower Market patterned paper, are perfect to fill gaps and add colour to the relatively neutral palette. 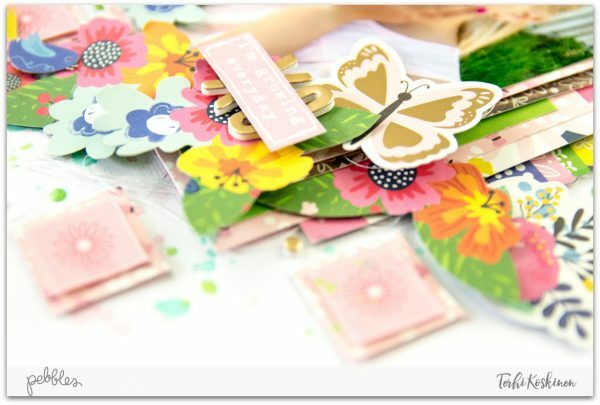 Extensions to this embellishment layer also include the dimensional stickers with the “thinking of you” sentiment as a subtitle. The title work features gold foil thickers that sit comfortably in the space provided above the photo. Use a set square ruler to provide a straight guide to lining up the letters. Note that the title doesn’t intrude on the fussy cut layers but rather frames and enhances the subtle message of positive thinking. Finally add your journaling. This can be as in depth as you like or kept very simple. Any private thoughts can be slipped behind the photo or written on the back of your layout. Just remember to be gentle on yourself. Mental health affects many people in many different ways and more often than not people suffer in silence. Hi everyone. 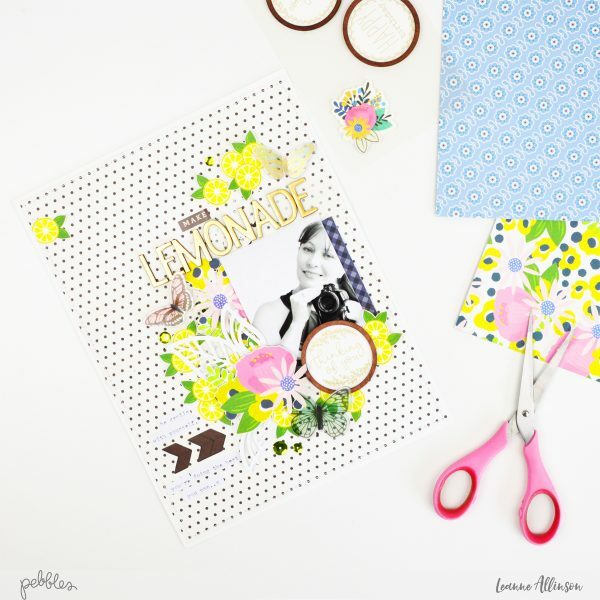 Heather Leopard is here and I’m sharing a few scrapbooking tips & tricks, and a process video with you today. 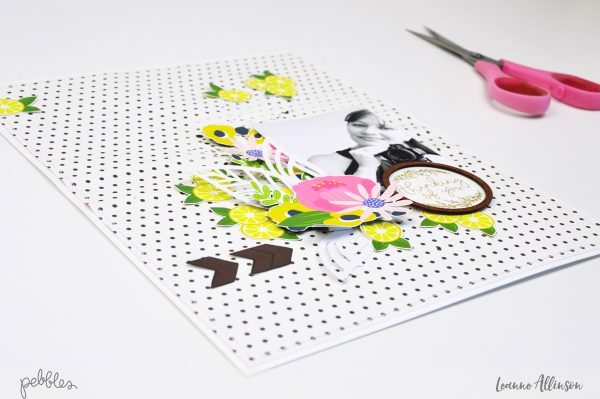 Some of these tips were part of my scrapbooking newbie “go-to” arsenal when I first started scrapbooking and others are still my tried and true essentials today. All of it is manifested in the process video below for this cutest pumpkin in the patch layout I did. CHALLENGES: The photo above relates to a current challenge here at Pebbles…many online groups and scrapbooking companies create challenges every month. These are great ways to help you focus on what to create. 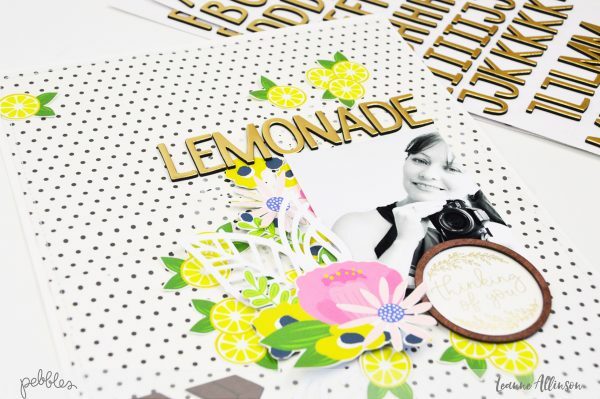 I find that I just have WAY too many photos to scrap so searching for “scrapbooking challenges” or terms along those lines are sure to uncover something that will inspire you. The bonus is that there’s usually some contest and reward. Sometimes it’s a gift card, sometimes a kit, sometimes it’s just the glory. 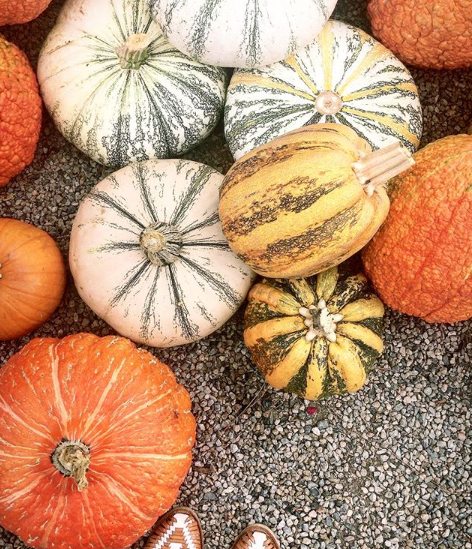 For example, Pebbles is currently hosting a “pumpkin-inspired” project challenge. I took that challenge on and created the layout above. 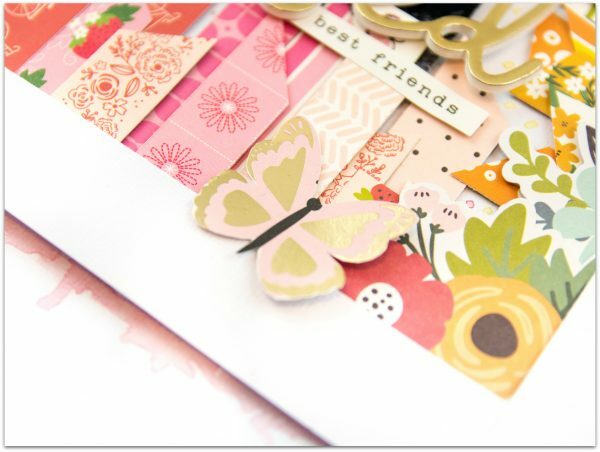 The current challenge is to create something pumpkin inspired so it can be a project, a card, a layout, whatever! Head over there to see the details. SKETCHES: Many people turn to sketches for inspiration. A sketch is like a recipe for scrapbooking. It doesn’t necessarily tell you how many of this or that or provide measurements but it’s a visual diagram of a layout. Some people choose to follow sketches exactly, while others use it as a jumping off point for their layout, meaning they see something in the sketch that inspires them and may only follow part of the sketch for their design. There’s really no rules for sketches. There are many sketch sites out there. 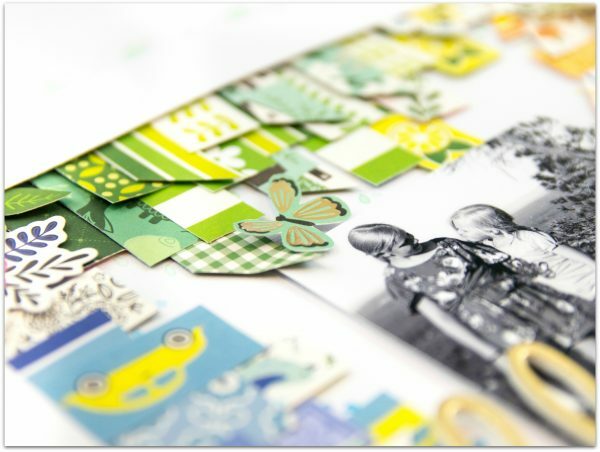 Just Google scrapbooking sketches and you’re sure to come up with many options. I also have sketches of my projects, which can be found HERE ON MY BLOG. 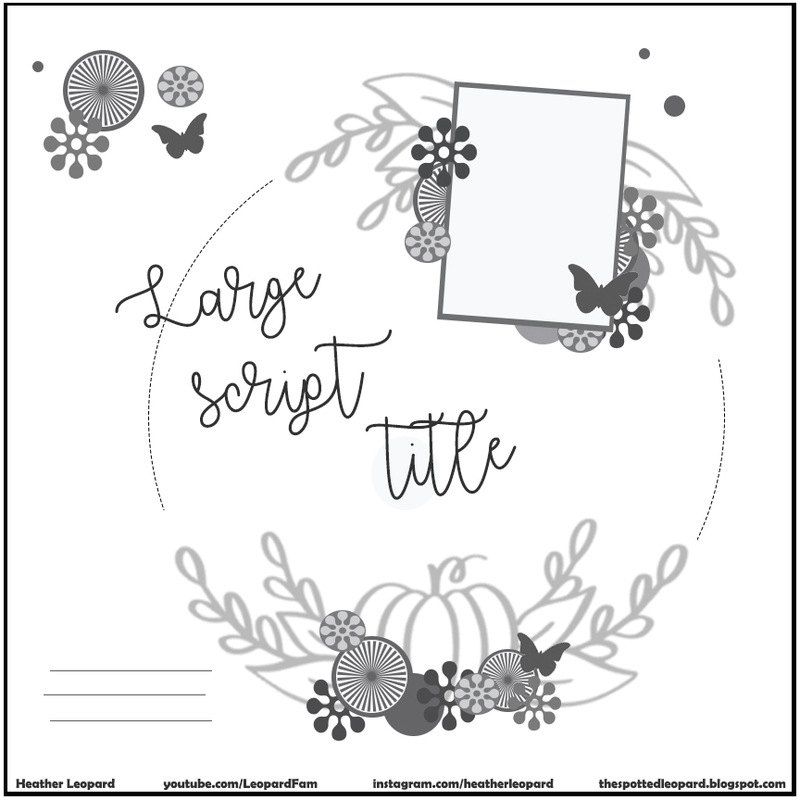 SCRAPLIFT someone: Visit scrapbook company blogs, your favorite designer’s blog, Instagram, YouTube, wherever find inspiration and choose a layout that you think suits your photos. 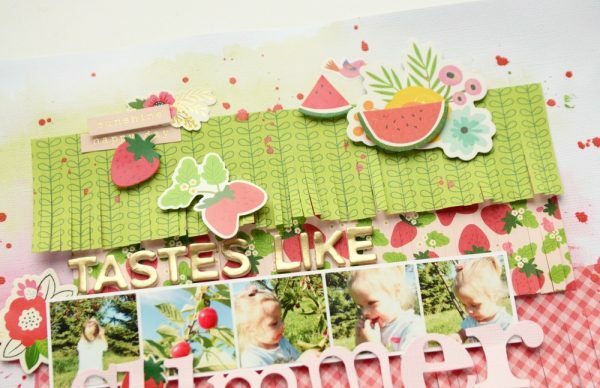 Like sketches, you can scraplift exactly like the original or use it as a jumping off point and take it whichever direction you choose. I see scraplifting as a form of compliment and if you post it online, it’s always courtesy to list the person who inspired you! If you can tag that person, they are sure to see what you did and leave you all sorts of wonderful feedback. The layout above was part of a collaboration I did with Christine Meyer, where we scraplifted each other. I did not scraplift exactly like hers. Instead, I chose two elements of her design – she had a small amount of the buffalo check and a circular floral design. You can see her original layout in the process video below. 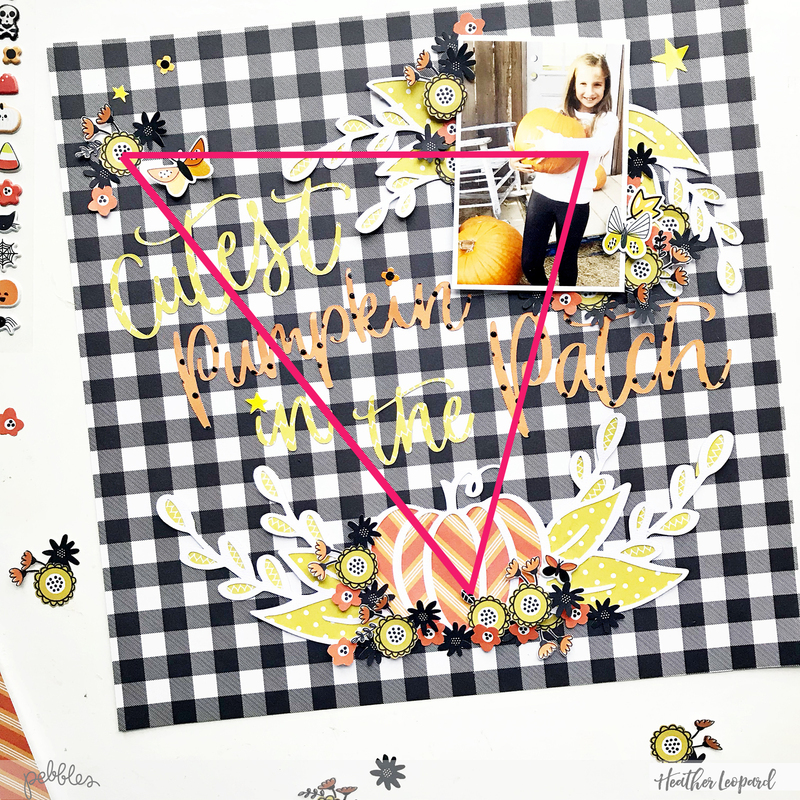 DESIGN: Whenever possible, I like to use a visual triangle design for my scrapbooking layouts. This helps guide the eye around the page to the important things you want to call out and can be easily accomplished by looking at the layout as having 3 anchor points. These anchor points usually have the same colors and many of the same elements. In the photo above, I have the photo at the top right (most important element), the pumpkin at the bottom and the floral cluster at the top left. Notice that the same colors are used but also the same flowers are the one thing that is the same in each of these areas. The triangle doesn’t have to have equal sides and things can be placed lower or higher or over more but just having a general triangle in the design should help with the flow of the layout. SUPPLIES: I like to make a kit for each of my projects. 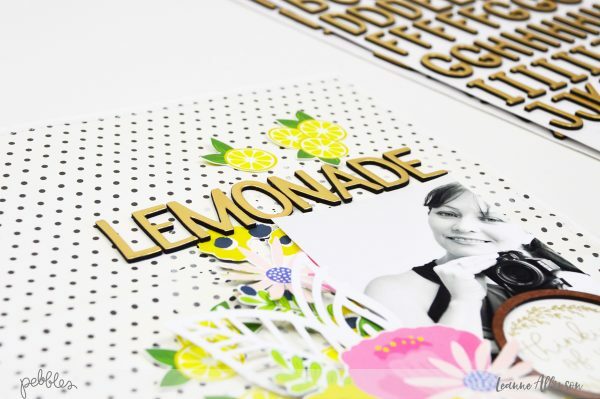 The easiest way to do this is to gather 6 – 7 patterned papers, 1 – 2 cardstock papers, alphas, die cuts, chipboard and stickers. 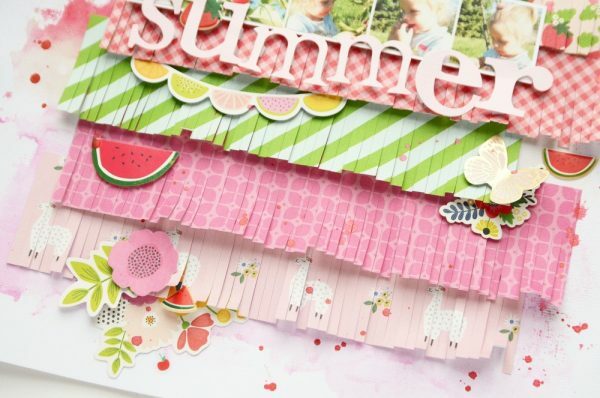 You can add additional embellishments, such as ribbon, washi, twine, enamel dots, etc. I like to print my photo and then make a kit using supplies that coordinate well with my photo. Or if you really want to use a certain color scheme and your photo doesn’t match, print it in black and white. 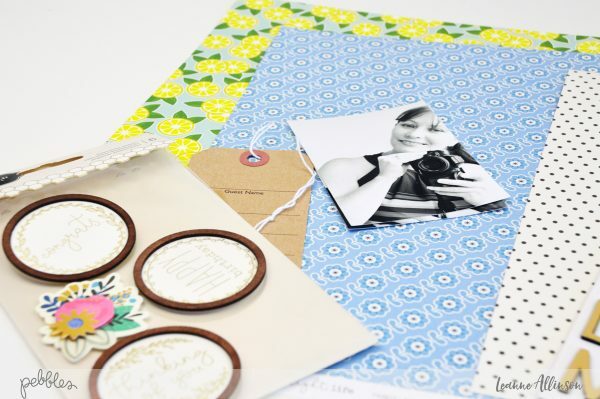 Creating kits before you start creating really helps you focus and speeds the scrapbooking process tremendously. Knowing what you have to work with also helps remove the design clutter in your head. Once you have the kit, you have everything at you fingertips. I used the Pebbles Spooky Boo and My Bright Life collections for this kit and layout. 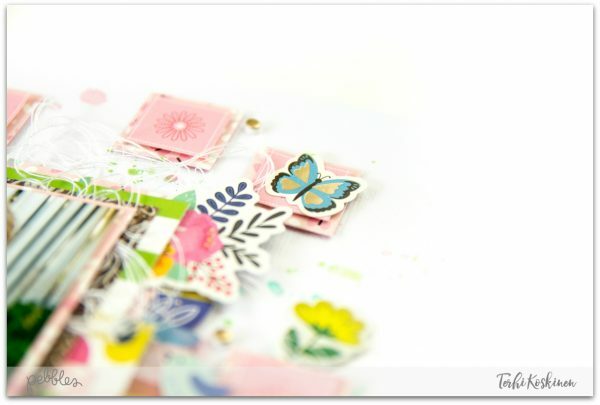 Watch my Process Video to see how I used these scrapbooking tips and tricks for this layout. Hey there! 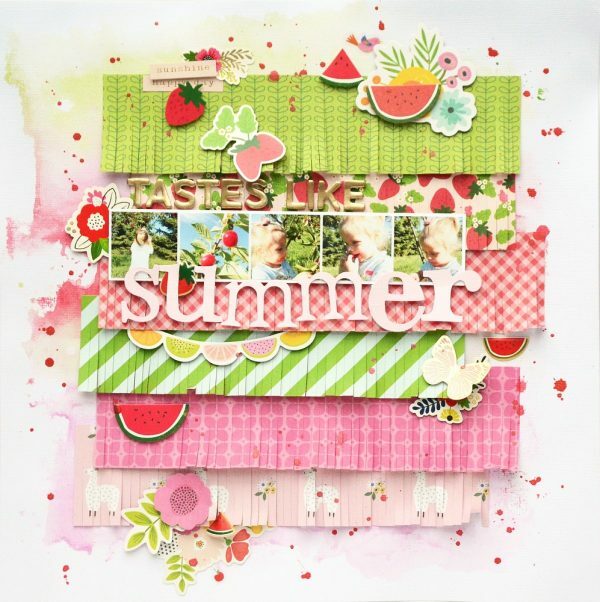 Terhi Koskinen back again sharing some scrapbooking love to all of you! 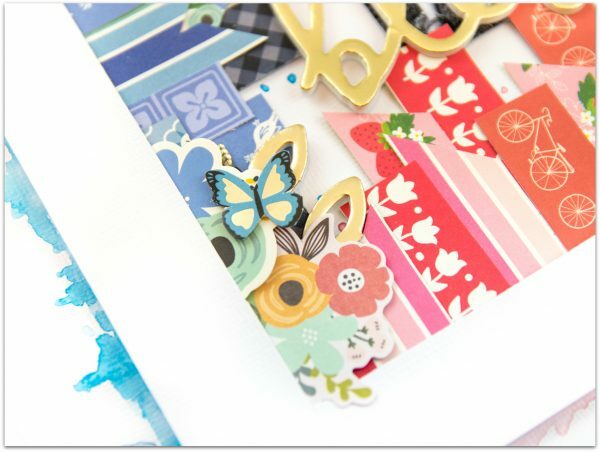 Today I’m diving into the world of the most beautiful collection from the lovely Jen Hadfield: My Bright Life. My Bright Life makes my life really bright, as it’s pure therapy to create with it seeing all the beautiful colors, patterns, flowers… I was so happily overwhelmed by this collection, I didn’t know from where to start creating and so I decided to go with the first thing came to my mind: my dear daughter who is as colorful as the collection is! Once again I recorded the creation process to a video, hope you have couple minutes to watch it. I’ll show you exactly how this layout was made, and you can follow up. Thank you for watching, and remember to subscribe my YouTube channel for more inspiration.